Modular Curriculum Development (our version of ADDIE) projects are undertaken for critical target audiences. They produce “performance-based” Training or Learning. This then leads to guided RAPID Development – where the Analysis and Design have already been done! MCD efforts Phases 1-3 can take from 1 to 2 months – and more often than not have been done in 5 days for development of dozens of days of blended mode and media. The cycle time for an MCD effort for all 6 Phases varies depending on the amounts of Mode, and Media per the Phase 3 Design. These proven efforts lead to a modular curriculum – not a curriculum of modules. Guy has done over 50 ISD/MCD projects to produce content – to date. This ISD methodology provides another structured, gated, in-control process for the fairly quick design, development, pilot testing, and revision/release of the T&D Modules and T&D Events of the CAD. The MCD process uses a proprietary process that is designed to incorporate representatives from stakeholder groups into the overall project’s activities and tasks. An MCD project is conducted in six phases using a team process. The MCD process allows the various concerns of management, job incumbents, and staff support groups to influence the design decisions. The project will be controlled by a Project Steering Team that will make the final decisions. Teams of top performers will be used to identify both the performance requirements and the associated knowledge/skills required. Additional teams will be used in the MCD process to ensure that all decisions reflect the needs/issues of the company. The six-phase structure provides the framework for the project activities, deliverables, and team structure. MCD projects typically span a 2- 3 or 4-month cycle including Pilot-Test and post-Pilot revisions, but small MCD projects can be conducted in much less time. We built and pilot tested, in a 90-day cycle, a four-day “labor relations” course with more than 50 percent of class time spent in intense simulation exercises/role-plays. Three ISDers were involved. The CAD outputs of the performance modeling and knowledge/skill analysis process and the CAD design specifications are used within the MCD process to drive the design to ensure it results in shareable T&D Modules and Events. Phase 1: Project Planning & Kick-off. Project priorities, direction, and resources are defined; potential issues and/or stakeholder requirements should be uncovered and planned for during this phase to ensure the success of remaining phases. MCD Phase 2: Analysis. A common view of the personnel, performance requirements, knowledge and skill requirements, and appropriateness and completeness of any existing T&D is established; this common view will form the basis for the training design. MCD Phase 3: Design. In this phase, the Design Team is facilitated through a systematic design process; some details are completed after the design meeting. Note: The intent of the team approach to design is not “to design by committee” but to influence “the designers by committee” during the actual design activities. MCD Phase 4: Development/Acquisition. In this phase, the training is developed and/or acquired/modified per the Design Document (produced in Phase 3). MCD Phase 5: Pilot Test. In this phase, the training is delivered (pilot tested), and extensive evaluations are conducted. MCD Phase 6: Revision & Release. In this phase, all materials are updated (per the “revision specifications” from Phase 5) and are released into the training system. The PACT Process for MCD is a powerful process, if populated with the right people to do the right things at the right times. The gates ensure that our customers and key stakeholders for our T&D product line are systematically engaged for our collective success—collaborative win-win. 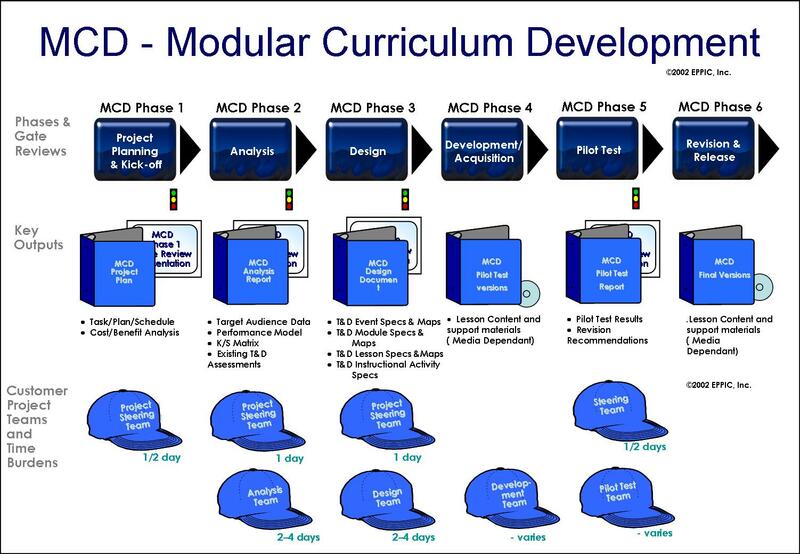 MCD uses the multiteam approach to plan and conduct a predictable project to develop and test performance-based T&D. Whether preceded by a CAD or not, MCD takes a proactive approach, with tools and templates to accelerate and ensure the quality of both the analysis and design efforts. The MCD methodology engages the right stakeholders at the right time for getting the right inputs and right decisions at the right time. It shortens the project time cycle and reduces costs for T&D projects. It increases the quality of the T&D product/service by focusing on desired performance as the terminal learning objectives. It structures T&D content into more shareable chunks, thereby reducing future costs. The MCD methodology provides a gated process for working with all project participants in an accelerated manner to produce performance-based T&D. The T&D professionals retain control of T&D decisions, and the stakeholders in your marketplace gain and exercise control of all the business decisions inherent in T&D projects and resourcing.